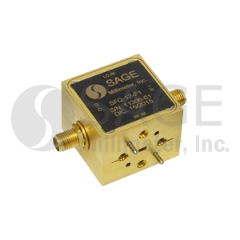 The SFN-55371318-15KFSF-N1-M from SAGE Millimeter is a Modulator with RF Frequency 27.5 to 71 GHz, RF Frequency 27.5 to 71 GHz, LO Frequency 27.5 to 71 GHz, IF Frequency DC to 3 GHz, Conversion Loss 18 dB. Tags: Module with Connectors, Waveguide. More details for SFN-55371318-15KFSF-N1-M can be seen below.